Also see Twitter, Facebook launch tools to track advertising (Reuters), which notes "Google has vowed to launch a similar transparency center for political ads on its services this summer. It declined to share additional details this week." "Social media companies, stepping up efforts to stop disinformation on their online platforms ahead of this year’s midterm elections, unveiled on Thursday new tools aimed at improving transparency around advertisements. In simultaneous announcements, Facebook and Twitter said they were broadening efforts around public, searchable archives of ads that run on their sites." "The 125m households the company serves, twice as many as it had in 2014, watch Netflix for more than two hours a day on average, eating up a fifth of the world’s downstream internet bandwidth. (China is the one big market where it is not allowed to operate.) Its ascent has mirrored the decline of traditional television viewing: Americans between the ages of 12 and 24 watch half as much pay-TV today as they did in 2010. Uniquely among tech upstarts that have reshaped industries in recent years, Netflix has wrought its transformation without triggering a public or regulatory backlash. With a share price that has more than doubled since the start of the year, it is as popular with investors as it is with consumers. All of which raises three questions. 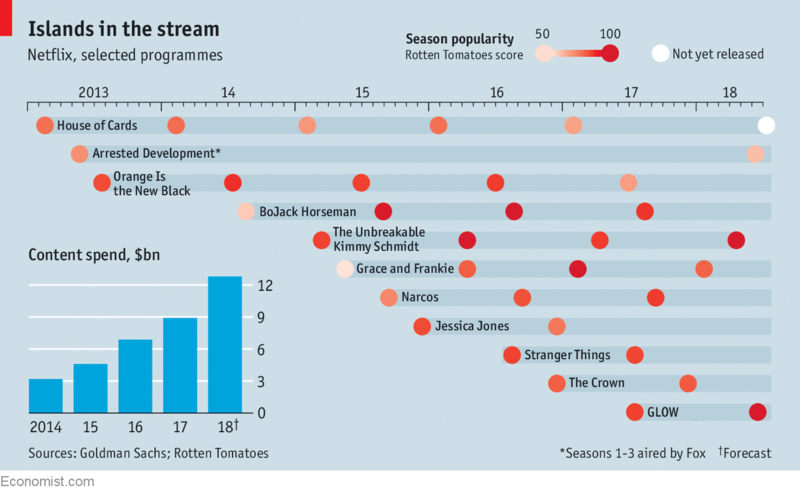 What are Netflix’s lessons for other media firms? What can the rest of the FAANGs learn from its success? And can it go on keeping everyone happy?" "As the digital money frenzy of the past few years cools, the crypto coin graveyard is filling up. Dead Coins lists around 800 tokens that are bereft of life, while Coinopsy estimates that more than 1,000 have bought the farm. The carnage is mostly the consequence of failed projects from the thousands of startups that used initial coin offerings to raise billions in funding, and a global regulatory crackdown on questionable practices and scams. Names like CryptoMeth, Droplex and Roulettecoin may have been a clue to the coins’ dim prospects." "The California Consumer Privacy Act is one of the toughest U.S. regulations targeting Silicon Valley, where recent privacy mishaps — many involving Facebook — have left consumers clamoring for greater protections online. The law requires tech giants to disclose the kind of data they collect about consumers and allows Web users to opt out of having their information sold to third parties, including advertisers. The new privacy rules, which are slated to come into effect in 2020, apply only to residents in the Golden State. That leaves time for corporate critics such as AT&T, Comcast, Facebook and Google to resume lobbying aggressively to revise it over the next year. Going forward, though, California’s privacy protections could force tech companies to change their business practices nationwide, rather than maintaining two systems: one in California, and another for everyone else. Apple, Facebook and Google took a similar approach in May after European regulators began implementing new privacy rules, known as General Data Protection Regulation, or GDPR." "In the world of health care, PillPack, an online pharmacy, is a pretty small player. Its work force of 1,000 or so people pales in comparison with the 235,000 who work for Walgreens. But when Amazon announced on Thursday that it was buying PillPack, the deal immediately shook the industry. Shares of Walgreens and Rite Aid tumbled more than 9 percent, while CVS Health dropped 6.6 percent. That’s because with one move, Amazon answered the question about when — and how — it would grab a piece of the $560 billion prescription drug industry." "Currently, Apple's subscription lineup is relegated to digital solutions like iCloud storage and Apple Music, the latter of which plays host to the company's two original TV shows, "Planet of the Apps" and "Carpool Karaoke: The Series." The tech giant could expand on the offering by lumping music in with additional products like original video content and an expected news subscription service. Announced in May, the Texture buy opens the door to a slice of digital magazine subscription revenue. The service, sometimes referred to as the "Netflix of Magazines," is still operational and offers customers access to more than 200 monthly titles for $9.99 a month, but that would undoubtedly change once Apple's branded service rolls out." "In a corner of SpaceX’s headquarters in Hawthorne, California, a small, secretive group called Ad Astra is hard at work. These are not the company’s usual rocket scientists. At the direction of Elon Musk, they are tackling ambitious projects involving flamethrowers, robots, nuclear politics, and defeating evil AIs. Those at Ad Astra still find time for a quick game of dodgeball at lunch, however, because the average age within this group is just 10 years old. Ad Astra encompasses students, not employees. For the past four years, this experimental non-profit school has been quietly educating Musk’s sons, the children of select SpaceX employees, and a few high-achievers from nearby Los Angeles. It started back in 2014, when Musk pulled his five young sons out of one of Los Angeles’ most prestigious private schools for gifted children. Hiring one of his sons’ teachers, the CEO founded Ad Astra to “exceed traditional school metrics on all relevant subject matter through unique project-based learning experiences,” according to a previously unreported document filed with the US Internal Revenue Service (IRS)." "“I wouldn’t have minded buying them, but it’s OK,” Greene said at a Fortune Magazine event in San Francisco on Wednesday. Alphabet Inc.’s Google has yet to confirm reports that it bid on the startup, a leading repository for software. Greene declined to say more about if Google bid. For Microsoft, GitHub is a key asset for appealing to developers in the competitive cloud computing market. Greene said that two Google products are among the most popular now used on GitHub. “I really hope Microsoft can keep them totally neutral,” she said." "Huffman and a colleague, Nick Fox, said they decided that Google Assistant would disclose this type of information upfront after experts raised concerns that people should have the right to consent before talking to a bot. “We decided we should be very clear,” Fox said. The executives said that legal considerations were not on their minds when they made the decisions. Two bills — one in Congress and one in California — would require such disclosure. But Google’s virtual assistant has a lead over competitors because of the vast data collection it uses to train its AI. And that’s pushing it into the mainstream faster than anyone else." Mechanical Truck?... Later in the article: "Executives at Amazon dismissed any link between the new delivery program and Mr. Trump’s Twitter attacks about its agreement with the post office." "The company announced Thursday a new program aimed at helping people start their own businesses delivering packages for Amazon. For a minimum investment of $10,000, people in the United States will be able to open and manage their own delivery service handling Amazon packages. Although the couriers will not be employees of the company, they’ll get access to Amazon-branded vehicles, uniforms and more. By the company’s calculations, an owner could earn as much as $300,000 a year in profit by operating a fleet of up to 40 vehicles." "If it is successful, blockchain technology will bring a new level of enhanced trust to business and will also cut out the middlemen that have historically tracked — and profited — from the complexity of so many different systems trying to communicate with each other. That could lower prices for goods and services. At the same time, for all the promise of blockchain, there are real questions about whether it may be applied to solve problems that don’t exist. Databases already exist and, in certain cases, a centralized database might actually be preferable to the blockchain." "Microsoft has been working on health-related initiatives for years, but the company is now bringing its efforts together into a new Microsoft Healthcare team. This doesn’t mean you’ll be visiting a Microsoft Store anytime soon for human virus scans, instead it’s a bigger effort to create cloud-based patient profiles, push doctors to the cloud, and eventually have artificial intelligence analyzing data. The software maker has hired two industry veterans to help out: Jim Weinstein and Joshua Mandel. Weinstein is the former CEO of the Dartmouth-Hitchcock Health system and joins Microsoft as the VP of Microsoft Healthcare, and will work with healthcare organizations to move systems to the cloud. Mandel joins as Microsoft Healthcare chief architect, after completing a nearly two-year stint at Google as an executive for the company’s Verily venture (formerly Google Life Sciences). Madel will be working closely with the open standards community to create an open cloud architecture for all healthcare providers." "It’s not a new threat. Ever since Google bought DoubleClick in 2007, letting advertisers buy ad spots directly online using real-time auction systems, there have been mutterings about Silicon Valley encroachment onto Madison Avenue turf. But there’s no denying that the power of Google and Facebook is increasing rapidly, as is shown by their quarter share of all the world’s advertising dollars. And the irony is that just as the EU is trying to limit the tech giants’ dominance, its new, much-praised General Data Protection Regulation may in fact make it harder to break Google and Facebook’s stranglehold on digital ads. While the agencies are racing to beef up their own internet businesses, the amount of personal data held by the Silicon Valley duo is already vast — and the new GDPR rules will deepen the competitive moat around it." "Facebook said there are now other companies in aerospace that are investing in the same kind of technology. So it’s time for the company to step out of the race. Instead of building, Facebook said it will work with partners like Airbus SE on high-altitude connectivity technologies. Though it ultimately didn’t live up to its ambitions in the skies, the Aquila drone served as a visible symbol of innovation at a company where all of the most important work usually happens behind the scenes, in lines of software code. The Aquila, demonstrated at Facebook’s conferences and, at one point, touted in an innovation lab at the company’s headquarters, was frequently held up as an example of the important work Facebook was doing as part of its mission to connect the world via the internet. The company is still working on other technologies that can spread online access." Final sentence: "Apple has never been scared of disrupting its own best inventions. By rethinking screens, it may have a chance to do that once more." "Tech has now captured pretty much all visual capacity. Americans spend three to four hours a day looking at their phones, and about 11 hours a day looking at screens of any kind. So tech giants are building the beginning of something new: a less insistently visual tech world, a digital landscape that relies on voice assistants, headphones, watches and other wearables to take some pressure off our eyes. This could be a nightmare; we may simply add these new devices to our screen-addled lives. But depending on how these technologies develop, a digital ecosystem that demands less of our eyes could be better for everyone — less immersive, less addictive, more conducive to multitasking, less socially awkward, and perhaps even a salve for our politics and social relations." "But now Catalog, a tiny startup with just $9 million in new funding, threatens to beat Microsoft to the punch, pledging to deliver the first commercial DNA storage product sometime next year. Big-data generators such as corporations and government agencies could use it to store billions of gigabytes of information in a space the size of a bedroom closet. “It’s a new generation of information storage technology that’s got a million times the information density, compared to flash” storage, said Catalog’s chief executive, Hyunjun Park, referring to the flash memory chips used in digital cameras and thumb drives. “You can shrink down entire data centers into shoeboxes of DNA.”"
"Facebook Inc.’s Instagram is estimated to be worth more than $100 billion, if it were a stand-alone company, marking a 100-fold return for the app was purchased in 2012, according to data compiled by Bloomberg Intelligence. The photo-sharing platform, which reached 1 billion monthly active users earlier this month, will likely help nudge Instagram revenue past $10 billion over the next 12 months, Bloomberg Intelligence analyst Jitendra Waral wrote in a report Monday. Instagram is attracting new users faster than Facebook’s main site and is on track to exceed 2 billion users within the next five years, Waral said. While the social network already has surpassed that milestone, Instagram’s audience is younger than its parent, making it more attractive to advertisers. And unlike Facebook, Instagram is still growing in the U.S."
Later in the article: "The AppNexus deal gives AT&T some of the same capabilities as Google and Facebook, but with one crucial advantage: control over premium content." "AT&T said Monday that it is buying the digital advertising company AppNexus, in an effort to hasten the growth of its new media empire. AppNexus gives the telecom giant control over one of the world’s largest Internet advertising exchanges, which marketers use to buy ad space from online publishers. It could help AT&T challenge Google and Facebook — the two giants of online advertising —- by bolstering its ability to analyze customer behavior and advertise against content produced by Time Warner, now renamed WarnerMedia." "Even with the cryptocurrency markets in an extended slump, the most prominent venture capital firm in the sector is doubling down. Andreessen Horowitz, the well-known firm that made early bets on Instagram and Reddit, said on Monday that it was creating a $300 million fund focused exclusively on projects inspired by the original virtual currency, Bitcoin. One of the leaders of the new fund will be the firm’s first female general partner, Kathryn Haun, a former federal prosecutor." Earlier in the article: "One attendee of the meeting said the encounter led the tech companies to believe they would be on their own to counter election interference." "“We’re getting so many mixed signals, depending on what the agency is,” Senator Richard Burr, Republican of North Carolina and chairman of the Senate Intelligence Committee, told reporters last week. He said his committee was planning to bring together intelligence officials next month to figure out what was going on and how the government should handle it. “It compels us to bring everybody together in the same room and try to figure out whether or not there’s some stovepipe issues,” Mr. Burr said. Part of the problem, officials say, is that the White House has expressed little interest in the problem of Russian interference, and that the apathy has had a trickle-down effect. Without pressure from the top, it can be difficult to bring together all the different strands of intelligence collected across America’s spy agencies, and evaluate how to act on it." Apple News, which is expanding to desktop, is seizing the moment of fear and confusion among readers over how much “fake news” (and what actually is fake news) they come across, and among news organizations of how little their audiences trust their work. Instead of promoting automation and algorithms or scale and speed, it’s highlighting the tightly controlled, “well-sourced, fact-based stories” news and information it’ll deliver to Apple News users around the 2018 U.S. midterm elections, “with breaking news, exclusive highlights and analysis from reliable sources selected by Apple News’ team of experienced editors.”"
"The India push is part of Google’s aggressive global expansion. The company recently invested $550 million in Chinese e-commerce giant JD.com Inc. and a smaller amount in India’s Fynd, giving it an online shopping toehold in the world’s most populous nations. Now it’s fine-tuning social and messaging, where it has had limited success with Google+, Hangouts and Allo. “General social networking is dominated by Facebook and peer-to-peer messaging by WhatsApp,” says Brandon Verblow, a New York-based analyst at Forrester Research. “However opportunities for local networking have not yet been fully exploited.”"
Later in the article: "The company has also internally discussed adding biometric sensors to future AirPods, like a heart-rate monitor, to expand its health-related hardware offerings beyond the Apple Watch, another person said." "Apple Inc. is about to pump up the volume on its audio-device strategy, planning higher-end AirPods, a new HomePod and studio-quality over-ear headphones for as early as next year, according to people familiar with the matter. The Cupertino, California-based company is working on new AirPods with noise-cancellation and water resistance, the people said. Apple is trying to increase the range that AirPods can work away from an iPhone or iPad, one of the people said. You won’t be swimming in them though: The water resistance is mainly to protect against rain and perspiration, the people said." "But as Amazon uses its powerful platform to bolster its private-label business, there is also debate in legal circles whether some of its activities could be viewed as monopolistic in nature. Some say Amazon could face a legal challenge akin in size and scope to when the Department of Justice two decades ago filed antitrust charges against Microsoft for bundling its own browser into its software, making it difficult for consumers to install a browser from Microsoft’s top competitor, Netscape. Microsoft lost that court battle. “I think there is a potential monopolization case against Amazon,” said Chris Sagers, an antitrust professor at the Cleveland-Marshall College of Law in Ohio. “The Amazon marketing people are geniuses. They’re brilliant,” Mr. Sagers said. “But if they are getting massive penetration in the market and preventing customers from buying products from their competitors? Well, it’s like they’re writing the plaintiff’s complaint for them.”"
"The two are locked in a bitter fight over the amount of royalties Apple’s suppliers should pay to use Qualcomm’s technology on telecommunications. Billions of dollars are at stake. A hearing in one case is under way at the U.S. International Trade Commission in Washington, and trials are scheduled for later this year in China and Germany. Apple wants the patent office to cancel four Qualcomm patents, saying they don’t cover new ideas. All are part of a patent-infringement lawsuit Qualcomm filed in 2017 against Apple in federal court in California." "In a company blog, Facebook acknowledged that fake news reports and doctored content have increasingly become image-based in some countries, making it harder for readers to discern whether a photo or video related to a news event is authentic. The company said it has expanded its fact-checking of traditional links posted on Facebook to photos and videos. Partnering with third-party experts trained in visual verification, the company will also flag images that have been posted on Facebook in a misleading context, such as, for example, a photo of a previous natural disaster or shooting that is displayed as a present-day event. Facebook will also use machine-learning tools to identify duplicates of debunked stories that continue to pop up on the network. The company said that more than a billion pictures, links, videos and messages are uploaded to the social platform everyday, making fact-checking difficult to execute by human review. The automated tools will help the company find domains and links that are spreading the same claims that have already been proved false. Facebook has said it will use AI to limit misinformation, but the latest update applies to finding duplicates of false claims." "The AirPower charger is also more advanced than the current competition because it includes a custom Apple chip running a stripped down version of the iOS mobile operating system to conduct on-device power management and pairing with devices. Apple engineers have also been working to squash bugs related to the on-board firmware, according to the people familiar. They asked not to be identified discussing a product that hasn’t been released yet. Apple designers eventually hope to remove most of the external ports and buttons on the iPhone, including the charger, according to people familiar with the company’s work. During the development of the iPhone X, Apple weighed removing the wired charging system entirely. That wasn’t feasible at the time because wireless charging was still slower than traditional methods. Including a wireless charger with new iPhones would also significantly raise the price of the phones." "In 2018, it pays to be on Jack Dorsey’s side. Square Inc. and Twitter Inc., which both count the tech titan as chief executive officer, are on the brink of boasting 100 percent gains this year. 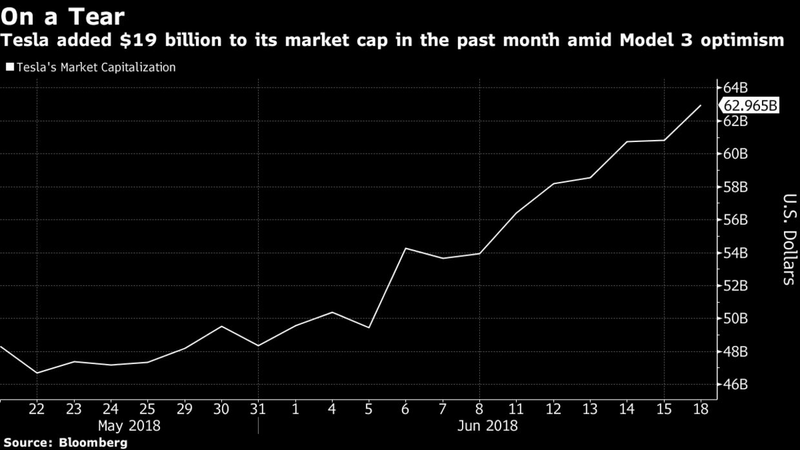 The firms are now worth more than $62 billion combined, surpassing the market value of Tesla Inc. In the past, investors have expressed skepticism about Dorsey’s ability to effectively run both companies at the same time. It seems some shareholders have put those concerns on the backburner." "There are other hopeful signs in the beyond-deep-learning camp. Vicarious, a start-up developing robots that can quickly switch from task to task like humans, published promising research in the journal Science last fall. Its A.I. technology learned from relatively few examples to mimic human visual intelligence, using data 300 times more efficiently than deep learning models. The system also broke through the defenses of captchas, the squiggly letter identification tests on websites meant to foil software intruders. Vicarious, whose investors include Elon Musk, Jeff Bezos and Mark Zuckerberg, is a prominent example of the entrepreneurial pursuit of new paths in A.I. “Deep learning has given us a glimpse of the promised land, but we need to invest in other approaches,” said Dileep George, an A.I. expert and co-founder of Vicarious, which is based in Union City, Calif."
"Amazon, Berkshire Hathaway and JPMorgan Chase, the powerful triumvirate that earlier announced its hope to overhaul the health care of its employees and set an example for the nation, said on Wednesday that it had picked one of the country’s most famous doctors to lead the new operation. Dr. Atul Gawande, a Harvard surgeon and staff writer for The New Yorker magazine, will become chief executive of the new company, which will be based in Boston, on July 9. He said he was not stepping down from his current medical and other duties to take the job." "The company announced at an event for Facebook video creators on Tuesday it would allow more content to be eligible for its Watch program. By doing so, it opens up the doors for both the company and social media stars to earn more advertising revenue. Facebook also announced Brand Collabs Manager, a platform that will connect video creators with sponsorship opportunities. Digital video advertising revenue is projected to hit $19.81 billion by 2020, according to eMarketer. Google's YouTube is considered the main home for online creator-made video content. Facebook, however, is trying to encroach on that territory with Tuesday's announcement, which follows reports of plans to expand the length of Instagram videos and introduce original Instagram shows." Final sentence: "There are currently no plans for an iOS app." See Listen up: Google Podcasts is now on Android (Google blog) for more details. “There’s still tons of room for growth when it comes to podcast listening,” said Zack Reneau-Wedeen, product manager on the app. Creating a native first-party Android app for podcasts “could as much as double worldwide listenership of podcasts overall,” he said." "Ford has been working to implement a so-called corporate fitness plan that aims to slash $25.5 billion in cumulative costs over the next four years and help the Dearborn, Mich.-based company catch up on profitability with its two traditional rivals, General Motors Co. and Fiat Chrysler Automobiles NV. This week, Ford purchased a long-abandoned train station in Detroit that it plans to redevelop into a technology hub for the development of electric and autonomous cars. The company says it is aiming to transform itself from an old-line manufacturer to a seller of high-tech transportation services." "Once the world’s most valuable company, GE will be replaced by Walgreens Boots Alliance Inc., the Deerfield, Illinois-based drugstore chain created in a 2014 merger. The change will take effect prior to the open of trading next Tuesday. Down 26 percent, GE is the worst performer in the Dow in 2018, as it was last year, as well. The change means the last original Dow member has finally been removed from the benchmark formed in 1896, with GE joining the likes of Distilling & Cattle Feeding, National Lead, Tennessee Coal & Iron and U.S. Rubber. GE briefly left the index, but has been in it continuously since 1907." "Wyden's investigation found that one of Verizon's indirect corporate customers, a prison phone company called Securus, had used Verizon's customer location data in a system that effectively let correctional officers spy on millions of Americans. In a letter to the Federal Communications Commission last month highlighting the probe, Wyden said prison officials using Securus's surveillance system could obtain real-time location data on Americans with little more than a "pinky promise" of propriety, leading to "activities wholly unrelated" to prison management. To gain access to the data, prison officers simply visited an online portal and uploaded an "official document" showing they had permission to access the information. But, Wyden told the FCC, senior Securus officials admitted that the company did not review the requests for information or require that supporting documents reflect the decision of a judge or other legal authority." "Over the last two days, The Onion has published around a dozen articles ridiculing the social network and its founder, and it says there’s more on the way. Why? The Onion’s editor-in-chief Chad Nackers told Business Insider that the comedy onslaught is because Zuckerberg has “repeatedly betrayed the trust of billions of people,” and because Facebook is choking off traffic to The Onion’s website. “We have 6,572,949 followers on Facebook who receive an ever-decreasing amount of the content we publish on the network,” Nackers said, calling Facebook an “unwanted interloper” between the publisher and its audience. In other words, The Onion is on a mission." "He said Facebook trying to favor outrageous content less often is like the NFL trying to fix its concussion problem: “It is the core of your business model.” A more feasible solution would be the left learning how to Facebook as well as the right does. “My point for Democrats is ... we need to build a progressive media infrastructure that is the bizarro version of the Republicans’,” Pfeiffer said. “It shouldn’t be propaganda, it shouldn’t be dishonest, it shouldn’t be racially divisive. It has to be the things that work best for Democrats: Inspirational, hopeful, fact-driven. But we need these nodes of amplification to carry the Democratic message, otherwise we’re going to get swamped again.”"
The worker, who had been denied a promotion, did “quite extensive and damaging sabotage” to Tesla’s operations, Musk wrote in the memo late Sunday, which was reported in full by CNBC. While a spokesman declined to comment, an employee who asked not to be identified confirmed he received the email. Tesla is conducting an in-depth investigation into the matter, including whether the worker was acting alone, with others at the company or with any outside organizations, Musk wrote. “As you know, there are a long list of organizations that want Tesla to die,” Musk said. He referenced Wall Street short sellers “who have already lost billions of dollars,” oil and gas companies that “don’t love” to see solar power and electric cars advancing, and automakers that produce gasoline and diesel vehicles. “If they’re willing to cheat so much about emissions, maybe they’re willing to cheat in other ways?” he said. Earlier in the article: "“It is unjust but it is reality. I am writing an article on an equivalent alternative to ICOs which the SEC cannot touch. Please have Patience.”"
"The offerings have come under increased scrutiny from regulators in recent months, with the SEC calling them securities that should be registered with the regulator. Some analysts have said paid promoters of ICOs may be breaking the law by acting as unregistered broker-dealers. In March, McAfee tweeted a web link that showed he charged $105,000 per tweet to promote ICOs and other products. The SEC and McAfee didn’t immediately respond to requests for comment." "There is little debate inside the government’s sprawling community of cyberwarriors and defenders that the United States needs to step up its game: It did not see the Russian hack of the 2016 election coming, or North Korea’s “WannaCry” attack last year, which crippled the National Health Service in Britain and rippled around the world, partly driven by stolen American cyberweapons. But the risks of escalation — of United States action in foreign networks leading to retaliatory strikes against American banks, dams, financial markets or communications networks — are considerable, according to current and former officials. Mr. Trump has shown only a cursory interest in the subject, former aides say, not surprising for a man who does not use a computer and came of age as a business executive in a predigital era. Efforts to rewrite the main document governing the presidential authorities in the cyberarena — Presidential Policy Directive 20, signed by Barack Obama — have faltered in the chaos of Mr. Bolton’s decision to oust the key players." "The future of augmented reality headgear and smartglasses is still very much in flux. The long-awaited Magic Leap might emerge this year. Microsoft's Hololens has hung in a state of enterprise limbo -- one from which it may finally emerge next year. Little smartglasses like ODG's might get better with Qualcomm's next chips, but don't expect miracles. Then there's Apple. As CNET reported in April, Apple is working on a powerful headset capable of both AR and VR. Whether that version is a "what if" prototype or something akin to what Apple may ship in 2 years is anyone's guess. But you don't need to wait until 2020: Apple's plans for virtual magic are playing out in real-time, right now, on the iPads and iPhones that your currently own." "What impressed medical experts most was Google’s ability to sift through data previously out of reach: notes buried in PDFs or scribbled on old charts. The neural net gobbled up all this unruly information then spat out predictions. And it did it far faster and more accurately than existing techniques. Google’s system even showed which records led it to conclusions. Hospitals, doctors and other health-care providers have been trying for years to better use stockpiles of electronic health records and other patient data. More information shared and highlighted at the right time could save lives -- and at the very least help medical workers spend less time on paperwork and more time on patient care. But current methods of mining health data are costly, cumbersome and time consuming." "The new publication will have a conventional website whose data will be written permanently into the secure digital ledger known as the blockchain. Expenses for the fledgling outlet will be covered by a grant from Civil, whose sole investor, for now, is ConsenSys, a Brooklyn-based blockchain software technology company founded by the Canadian entrepreneur Joseph Lubin. Mr. Lubin is also a co-founder of the Ethereum, a virtual currency and blockchain database company. As part of its plan to fund new media entities, Civil plans to unveil a new token this summer called CVL. People who purchase the CVL token, a form of cryptocurrency, will have a say concerning the projects hosted by Civil — meaning that they can vote on whether one of its websites violates the company’s journalism standards, which are outlined in the Civil Constitution." "Twitch began in 2011 as an offshoot of Justin.tv, a lifecasting site founded by two Yale graduates, Emmett Shear and Justin Kan. They started the platform after they found that viewers were more interested in watching their lifecasters play video games than eat or sleep. Big tech companies came courting, and Amazon beat out Google. In the four years since the sale, video gaming as a spectator sport has gone mainstream, and Twitch has captured the majority of those who want to watch it live. For the dedicated fans, the live, freewheeling sessions on Twitch have the appeal of a major sporting event crossed with a talk show. The interaction between the host and viewers is one key to the site’s success, making for an involved viewing experience that is markedly different from the prerecorded and edited videos of game sessions that have long been popular on YouTube." "“History shows us that companies that have the technical capacity to do things, the business incentive to do them and the legal right — they will take advantage of what is made available to them,” said Jessica Rosenworcel, an F.C.C. commissioner and a Democrat, who voted against the repeal of net neutrality last year. By repealing neutrality rules, the government has just given our online overlords that legal right, she cautioned. “Now they can block websites and censor online content,” Ms. Rosenworcel said. “That doesn’t make me feel good — and if you rely on the internet to consume or create, it shouldn’t make you feel good, either.”"
"In response to the panel’s report, DeepMind said that its health-care division is continuing to define its commercial approach. "We’re developing our longer-term business model and roadmap, and look forward to sharing our ideas once they’re further ahead," DeepMind said in a statement. "Rather than charging for the early stages of our work, our first priority has been to prove that our technologies can help improve patient care and reduce costs." The company has also said in the past that it does not share data with Alphabet or with sister company Google. But the panel said DeepMind needed to provide more clarity around this policy, since DeepMind does store and process data in Google’s data centers." "“Based on my understanding of the present state of ether, the Ethereum network and its decentralized structure, current offers and sales of ether are not securities transactions,” Hinman said. Hinman's remarks suggest that, unlike companies, which are required to educate stock investors about the health of their businesses, the developers behind bitcoin and ether face no such obligations. The basis for this conclusion, Hinman said, lies in the fact that bitcoin and ether are developed diffusely, by many unaffiliated people, rather than by a single, centralized entity such as a corporation. “As a network becomes truly decentralized, the ability to identify an issuer or promoter to make the requisite disclosures becomes difficult and less meaningful,” Hinman said. “As with bitcoin, applying the disclosure regime of the federal securities laws to current transactions in ether would seem to add little value.”"
"Winning the nod means the city of Chicago will negotiate exclusively with Boring for one year over details of the project, which aims to connect downtown Chicago with O'Hare, about 15 miles and a $40 taxi ride away. A final go-ahead requires approval from the city council. In its request for proposals, the city set a goal of connecting downtown with the airport in 20 minutes or less, with service every 15 minutes for the majority of the day. It also requested that fares be below the current rates for taxis and ride-share trips. Currently, Chicagoans can ride to the airport for $5 on a Chicago Transit Authority train, taking about 40 minutes." Twitter shares have rallied more than 80 percent this year, as investors grow confident in the company’s turnaround strategy and pace of product innovations. Dorsey has focused on using artificial intelligence to personalize content for people and improve the algorithms to filter out spam and automated accounts called bots. Yet while the changes have encouraged existing users to spend more time on the platform originally known for its 140-character posts, monthly active users gained 2.8 percent to 336 million in the first quarter compared to a year earlier -- the slowest pace of growth in two years." "In light of the medium’s sci-fi potential, Snapchat’s 3D Bitmoji animations are relatively primitive. Philip Lelyveld, director of immersive media at the University of Southern California’s Entertainment Technology Center, said the cartoons were “one step ahead of Pokémon Go,” the mobile game that first created mass awareness of A.R. in 2016. Helen Pappagianis, an A.R. researcher and author of the book “Augmented Human,” likened 3D Bitmoji to silent films in the early days of cinema. The equivalent of blockbusters, which will rely on special headsets like Magic Leap’s Lightwear and Microsoft’s HoloLens, are in development. And Facebook (which owns the virtual reality company Oculus), Apple and Google have all moved in the last year to make it easier for third-party developers to create new kinds of A.R. experiences for mobile phones. But Snapchat’s animators here in Los Angeles have already created the medium’s first hit series, thanks to uniquely appealing main characters that are flipping, dancing and pratfalling their way into the hearts of the company’s 191 million daily users. While Snapchat doesn’t share viewership numbers for 3D Bitmoji, a spokeswoman for the company told me that 70 percent of its daily users are using their Bitmoji avatar on the app." "Apple said the change, which would disable the Lightning port on the bottom of iPhones an hour after users lock their phones, is part of software updates to be rolled out in the fall. Designed to better protect the private information of iPhone users, it will have little obvious effect on most people using the devices but will make it far more difficult for investigators to use extraction tools that attach through the port to collect the contents of seized iPhones. Yet some authorities almost certainly will see it as yet another barrier to carrying out their legally sanctioned investigations." "The offbeat world of cryptocurrencies has drawn interest from all sorts over the last few years, from drug dealers and scam artists to the biggest companies in Silicon Valley and the most staid institutions of Wall Street. It is not a shocking place for Mr. Bannon, 64, to plot his re-emergence. Cryptocurrencies have many of the characteristics that drew him into Tea Party politics: They break old rules, they exist on the periphery, and they pose a challenge to the powerful figures and institutions that have long called the shots. “It’s disruptive populism,” Mr. Bannon said in the interview, at his Capitol Hill townhouse in Washington. “It takes control back from central authorities. It’s revolutionary.”"
Tesla shares pared an earlier gain of as much as 6.9 percent and closed up 3.2 percent at $342.77. Since it started trading in 2010, the stock has risen at a blistering pace driven by optimism that Tesla would lead a new era of transportation innovation. In the past 12 months, amid production snags and debt-related jitters, shares have fallen 4.5 percent, while Ford Motor Co. and General Motors Co. have climbed." "How quickly are things changing? Netflix recently surpassed Disney to become the most valuable media company at $158 billion. That helps set the stakes for the pending clash between Comcast and The Walt Disney Company as each seeks to own the bulk of 21st Century Fox. In December, Disney struck a $52.4 billion, all-stock deal to buy much of 21st Century Fox’s assets. Now, Comcast plans to announce its own offer for 21st Century Fox’s assets as early as Wednesday, according to two people familiar with the matter who spoke on condition of anonymity to discuss company business." "Many industry players expressed concern at the time that the prices were being pushed up at least partly by activity at Bitfinex, one of the largest and least regulated exchanges in the industry. The exchange, which is registered in the Caribbean with offices in Asia, was subpoenaed by American regulators shortly after articles about the concerns appeared in The New York Times and other publications. Mr. Griffin looked at the flow of digital tokens going in and out of Bitfinex and identified several distinct patterns that suggest that someone or some people at the exchange successfully worked to push up prices when they sagged at other exchanges. To do that, the person or people used a secondary virtual currency, known as Tether, which was created and sold by the owners of Bitfinex, to buy up those other cryptocurrencies." "Anduril is barely a year old, and the trespassing I’d witnessed was part of an informal test on a rancher’s private land. The company has installed three portable, 32-foot towers packed with radar, communications antennae, and a laser-­enhanced camera—the first implementation of a system Anduril is calling Lattice. It can detect and identify motion within about a 2-mile radius. The person I saw in my headset was an Anduril technician dispatched to the valley via ATV to demonstrate how the system works; he was about a mile away. As Luckey and his team see it, Lattice will become not just a system for securing the border but a general platform for geographic near-omniscience. With the aid of artificial intelligence, it aims to synthesize data from potentially thousands of sensors and local databases, displaying the most relevant data in phone apps, on laptop screens, and in mixed-reality headsets. Anduril’s goal is to become a major tech startup that builds hardware and software specifically for the defense industry, a venture-capital-infused outsider challenging the likes of Lockheed Martin and Northrop Grumman with their multibillion-dollar government contracts and strong establishment ties." "Now things are up for grabs: Netflix buys stuff from the studios, but it’s making its own stuff, too, and it’s selling it directly to consumers. That’s one of the reasons older media companies are trying to compete by consolidating. And new distributors like Verizon and AT&T are getting in on the action. AT&T, for instance, wants to merge with Time Warner. Meanwhile, giant tech companies like Google, Amazon and Apple that used to be on the sidelines are getting closer and closer to the action. 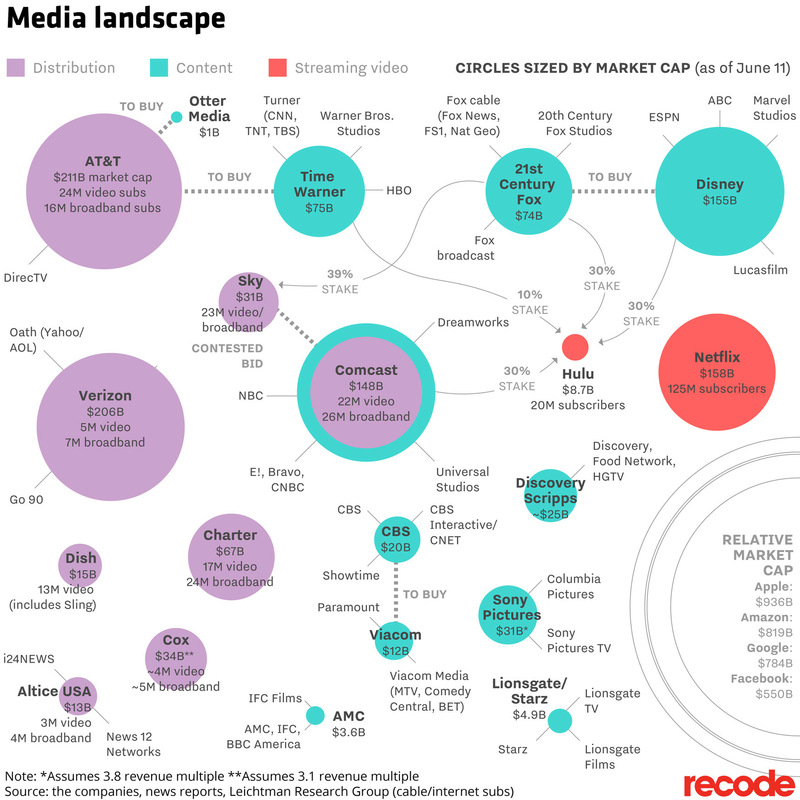 To help sort this all out, we’ve created a diagram that organizes distributors, content companies and internet video companies by market cap and their main lines of business." "Microsoft has been teasing it’s working on game streaming from the cloud recently, but today at E3 the company made it official. Phil Spencer, Microsoft’s gaming chief, revealed the company is hard at work building a streaming game service for any device. “Our cloud engineers are building a game streaming network to unlock console gaming on any device,” says Spencer, and the service will work across Xbox, PCs, or phones. Spencer didn’t give any firm dates on when the service will be available, but he’s previously teased Xbox game streaming within three years. Many have tried and failed to create a game streaming service, and it’s a challenging thing to get right. Sony acquired streaming games service OnLive only to shut it down, and previously acquired Gaikai which eventually became part of its PlayStation Now service. Nvidia is trying to stream games to PCs, but all these existing services will suffer some form of latency that hold them back from being widely used." "The two events in Washington could lead to further consolidation of wireless, cable and content giants, public-interest advocates say. And they fear that behemoths like AT&T might someday prioritize their own TV shows and other content over rivals’. Internet service providers, or ISPs, deny that they would engage in such a practice — yet consumer watchdogs worry that consumers would have little legal recourse if they did. “I think this could be a one-two punch to consumers and online competition,” said Gene Kimmelman, the president of Public Knowledge, a D.C.-based public interest group. “The combination of no net neutrality and video consolidation creates new bottlenecks that empower the traditional media industry to raise prices and limit online competition.”"
"Nearly two-thirds of Brazil’s 200 million people use WhatsApp to share memes, set up meetings and, increasingly, to vent about politics. Now, the messaging app is helping Brazilians undermine established power structures, injecting a level of unpredictability and radicalization into a country beset by economic and political crises. WhatsApp is particularly suited to organized movements. Unlike Facebook or Twitter, which often provide information to wider audiences, WhatsApp requires users to be invited to participate in groups, which leads to increased intimacy and secrecy, according to researchers. The platform’s voice messaging and photo sharing options enable users of varied educational backgrounds to take part in discussions. And it is free. Disgruntled Uber drivers, feminists and hard-line conservatives here use the app to share ideas and plan get-togethers." "Bitcoin extended losses for a third day, tumbling 12 percent Sunday as South Korean cryptocurrency exchange Coinrail said there was a "cyber intrusion" in its system. The largest cryptocurrency declined to $6,749 as of 2 p.m. in New York, the biggest drop since March 14, according to data compiled by Bloomberg from Bitstamp pricing. That widens Bitcoin’s losses for the year to 53 percent. Peer cryptocurrencies Ethereum and Ripple fell 11 percent and 12 percent, respectively." "Amazon, not surprisingly, is pitching the Fire TV Cube as the perfect Frankengadget for your TV, something that not only gives you full Echo features but is supposed to drastically simplify your TV experience. But as with any hardware product from a company that has some services skin in the game, the Fire TV Cube is not a perfectly agnostic streaming platform. Like every other FireOS device, the Fire TV Cube doesn't play content purchased through iTunes. Apple TV, on the other hand, now streams Amazon Prime Video, so Apple has the distinct advantage there. More important is FireOS's lack of a native YouTube app. Thanks to a spat that Google and Amazon can't seem to resolve, your only option for watching YouTube videos on an Amazon device right now is to use a browser." "“It” was an early mock-up of a cabin that will reside inside a commercial space station, among the first of its kind, that Axiom is building: a mash-up of boutique hotel, adult space camp, and NASA-grade research facility designed to hover approximately 250 miles above the earth. Axiom hired Philippe Starck, the French designer who has lent panache to everything from high-end hotel rooms to mass-market baby monitors, to outfit the interior of its cabins. Mr. Starck lined the walls with a padded, quilted, cream-colored, suede-like fabric and hundreds of tiny LED lights that glow in varying hues depending on the time of day and where the space station is floating in relation to the earth. “My vision is to create a comfortable egg, friendly, where walls are so soft and in harmony with the movements of the human body in zero gravity,” Mr. Starck wrote in an email, calling his intended effect “a first approach to infinity. The traveler should physically and mentally feel his or her action of floating in the universe.”"
"It’s finally happening: Next year, people around the world will spend more time online than they do watching TV, according to new data from measurement company Zenith. In 2019, people are expected to spend an average of 170.6 minutes each day on online activities like watching videos on YouTube, sharing photos on Facebook and shopping on Amazon. They’ll spend slightly less time — 170.3 minutes —watching TV." "It’s important to understand the nature of the problem. The effects of social media manipulation are slight at any given time. But slight changes applied consistently and carefully can have big effects. An initially minute compound interest can turn into a big reward for a patient investor. In the same way, slight but predictable changes to the behavior of a population can be gained through adaptive algorithmic adjustments to social media experiences. The problem is weirdly devilish. It attacks the very mechanisms that ought to protect us. The damage is reminiscent of the way AIDS undoes the immune systems that would normally battle disease. Once elections are made suspect, for instance, then politicians have little choice but to cling to the results that brought them to office. If a politician says, “I might not have been legitimately elected,” then that politician is undone, and chaos ensues. There is no way out." Rather, if we continue to rely on social media to do much of the heavy lifting of keeping in touch, then privacy violations that damage trust are likely to have a subtler chilling effect. People won’t abandon social media en masse; they’ll just be a little quieter, a little more careful, a little less personal. And social media won’t be a very good tool for real, authentic connection." "Instead of being able to see directly outside, passengers view images projected in from outside the aircraft using fibre-optic cameras. The airline says it paves the way for removing all windows from future planes, making them lighter and faster. Emirates president Sir Tim Clark said the images were "so good, it's better than with the natural eye". The virtual windows can be found in the first class cabin of Emirates' newest Boeing 777-300ER aircraft." "YouTube has been interviewing senior newspeople for a position at the company that is believed to relate to a new YouTube news initiative, according to three publishing sources who are familiar with YouTube’s plans. What exactly YouTube is planning is unclear. Two sources speculated that YouTube may follow Facebook’s playbook and pay news publishers for exclusive videos or simply roll out a new way to promote videos from accredited news outlets on its platforms to combat the spread of fake news videos. The latter seems more likely. For one, YouTube is said to be eyeing people with proven journalism backgrounds for the aforementioned position." "The problem historically is that none of Facebook’s efforts have delivered enough revenue to publishers to counterbalance the time and effort that goes into producing the work. Facebook won’t pay these news publishers out of pocket forever, which means they’ll eventually need to establish consistent audiences big enough to generate ad revenue that will pay for the production costs (and then some) on their own. So far, we haven’t seen evidence that this is possible on Facebook, which isn’t yet a proven video destination in the way that YouTube or Netflix are. With Facebook trying to figure that out, and news publishers desperate to keep pace, we’re in for another experiment. Facebook, of course, will be fine. Whether or not news publishers come out the other side of this tunnel feeling pleased or not is the question." "Yet Wall Street has remained oddly skeptical over the years. Apple is valued at 15 times estimated earnings over the next 12 months, which is slightly less than the Standard & Poor’s 500-stock index over all. And peers trade at a substantial premium, with Facebook at 22 times forward earnings and Microsoft and the Google parent Alphabet on a multiple of 25. That’s too large a gap. Microsoft is projected to grow roughly as fast as Apple this year. Facebook and Google are growing faster, but they are in the line of fire from consumers and regulators over data gathering and privacy worries. Apple’s conference this week may be short on pizazz, but the nearly trillion-dollar company can tweak its business without the distraction of defending it." Later in the article: "Among WhatsApp’s competitors is Signal, an encrypted messaging app run by a nonprofit called the Signal Foundation and dedicated to secure communication, with strict privacy controls and without advertising. Mr. Acton donated $50 million to fund the foundation and serves as its executive chairman." "When Mr. Acton departed Facebook, he forfeited about $900 million in potential stock awards, according to people familiar with the matter. Mr. Koum is expected to officially depart in mid-August, in which case he would leave behind more than two million unvested shares worth about $400 million at Facebook’s current stock price. Both men would have received all their remaining shares had they stayed until this November, when their contracts end. The amount the two executives are leaving in unvested shares hasn’t been reported, nor have the full extent of the details around their disagreements with Facebook over the years." "A truly fun aspect of Microsoft’s acquisition of GitHub is that it was announced before Apple Inc.’s Worldwide Developers Conference. This is like when Passover overlaps with Easter in New York City. The WWDC, sacred nerd summit of Appledom, is where they announce things like a new “night mode” for the operating system and try to convince programmers that Apple Watch matters. But GitHub is nerd infrastructure. Huge portions of modern culture—Google’s TensorFlow machine-learning software, for instance, and even other programming languages, such as Mozilla’s Rust—run on code managed there. For Microsoft to trot this out during WWDC is a real thunder-stealer. It’s nice to see global-platform capitalism played with a little verve. GitHub represents a big Undo button for Microsoft, too. For many years, Microsoft officially hated open source software. The company was Steve Ballmer turning bright colors, sweating through his shirt, and screaming like a Visigoth. But after many years of ritual humiliation in the realms of search, mapping, and especially mobile, Microsoft apparently accepted that the 1990s were over. In came Chief Executive Officer Satya Nadella, who not only likes poetry and has a kind of Obama-esque air of imperturbable capability, but who also has the luxury of reclining Smaug-like atop the MSFT cash hoard and buying such things as LinkedIn Corp. Microsoft knows it’s burned a lot of villages with its hot, hot breath, which leads to veiled apologies in press releases. “I’m not asking for your trust,” wrote Nat Friedman, the new CEO of GitHub who’s an open source leader and Microsoft developer, on a GitHub-hosted web page when the deal was announced, “but I’m committed to earning it.”"
"Kitty Hawk, the Mountain View, Calif.-based flying car company founded and backed by Larry Page, is offering a new glimpse of one its upcoming aircraft: a single-person recreational vehicle. The Kitty Hawk Flyer sports 10 battery-powered propellors [sic] and two control sticks, and looks like a human-sized drone, according to photos and videos of the final design posted to the Kitty Hawk website on Wednesday morning. 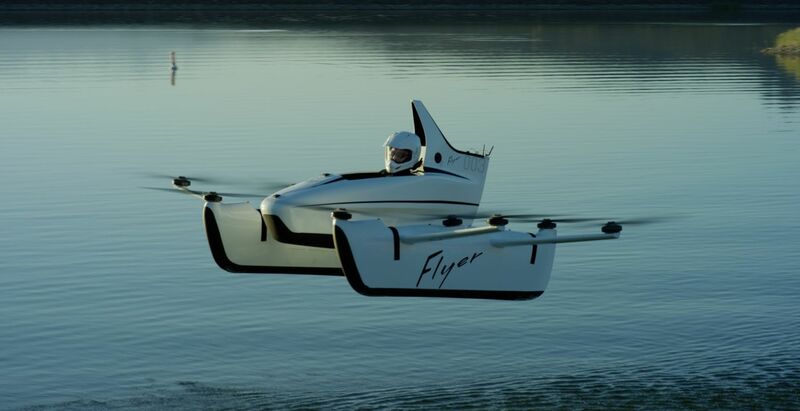 At first, it will go 20 miles per hour and fly up to 10 feet in the air, the company said." "Google’s leaders also seem to have forgotten the vital role the government, and especially the Pentagon’s Defense Advanced Research Projects Agency, played in creating the internet and making their company possible in the first place. Yet, from Apple’s refusal to unlock the iPhone of a mass-murdering terrorist to Project Maven, tech firms have repeatedly snubbed law-enforcement, intelligence and defense agencies. Fortunately, some tech companies have deigned to help the U.S. defend itself. Amazon.com’s cloud computing arm has collaborated with the intelligence community as well as the Pentagon, and is believed to be the front-runner for a (highly controversial) multibillion-dollar Department of Defense contract. But Google’s decision may put pressure on other firms and their funders to shun the Pentagon in the future. Will Microsoft, IBM and others that Google reportedly beat out for the initial Maven contract, which expires in 2019, get back in the bidding for the next one? Hopefully so. Helping to defend the U.S. is nothing to be ashamed of. That shouldn’t be a controversial idea among our nation’s business leaders." "Auletta surveys the tumultuous, treacherous ad landscape through the framework of frenemies. Not only are Madison Avenue and Silicon Valley frenemies, but so, too, he declares, are ad agencies and their marketer clients; agencies and media companies; traditional and digital media companies; agencies and consultancies like Accenture and McKinsey; agencies and software firms like Adobe and Salesforce.com; and, perhaps most telling, advertising and consumers. The easier it becomes for the public to zip, zap through and avoid interruptive ads — through innovative technology like ad blockers and streaming video — the madder, and more anxious, the mad men (and women) grow. Yet as dire as their fate looks, some flowers bloom amid the gloom, taking the edge off the book’s pessimism. A respected industry strategist, Rishad Tobaccowala, tells Auletta: “People say we are dinosaurs. We are not dinosaurs. We are cockroaches. Everybody hates us. Nobody likes to see us. But cockroaches have outlived everyone. We scurry out of corners. We soldier on and hire people with different skill sets.”"